Redemption and Release is known industry-wide as being the first and only Timeshare Redemption office. Over the past five years Larry Morse, CEO and Founder, has formed strategic partnerships with inventory wholesalers, sales aggregates and the resorts themselves to offer a safe and inexpensive timeshare liquidation program. Primarily focused on timeshare ownerships, Redemption and Release reviews all forms of vacation ownership and can also offer similar liquidation assistance to RV title transfers and whole owned luxury vacation homes located in the Mid-Atlantic U.S. Redemption and Release reviews hundreds of properties weekly to qualify them for our services. Having a robust service portfolio, money back guarantees, and the industry’s highest awards and accreditation has helped to separate Redemption and Release from the rest of the industry – and these testimonials prove it! 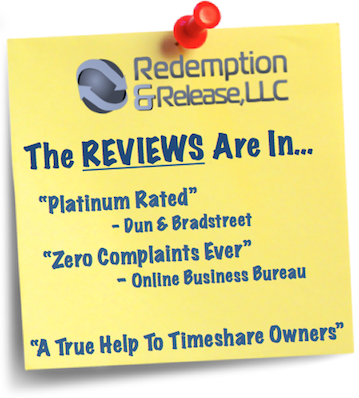 The reason why the Redemption and Release, LLC reviews are so positive and we have a 100% success rate and a zero complaint history is because we bridge a fundamental gap missing in the timeshare ownership cycle. Our typical clients have many years of successful timeshare ownership, but recently their travel habits have changed or they have become disenchanted with their timeshare ownership. This change in desire of ownership leaves these same owners looking for a safe and effective exit solution. Unfortunately, due to this tsunami of timeshare owners seeking to divest themselves from their financial obligations, it has left the secondary market devastated. An overwhelming supply and virtually no demand. Timeshare owners can no longer expect to sell their property and the market is currently to where consumers cant even give away their timeshare ownership. The timeshare owner is now stuck indefinitely paying fees for something they have no desire to own and can’t sell. Over the past 5 years we worked with hand-in-hand with Travel Clubs who absorb this unwanted inventory for exclusive memberships into their clubs. Redemption and Release reviews these partner contracts annually to ensure that they have maintained their commitment to maintaining their position in our vendor space to absorb condos from the inventory pool. The relationships we formed with these top rated clubs over the past 5 years has given us the ability to take over these otherwise “toxic” assets and repurpose them successfully to Travel Clubs. Redemption and Release, LLC is successfully bridging the gap between desperate timeshare owners looking to divest their ownership and large scale inventory aggregates that absorb these properties. In every case, our cardholders timeshare is deeded to our name and we assume all financial responsibilities on the property We later divest our ownership to an interested Travel Club or maintain it for our own marketing purposes. The benefit for our owners is tremendous, and they always receive what they paid for – a legal and permanent end to their timeshare ownership.